Media have tended to depict childfree people negatively, likening the decision not to have children to “whether to have pizza or Indian for dinner.” Misperceptions about those who do not have children have serious weight, given that between 2006 and 2010 15% of women and 24% of men had not had children by age 40, and that nearly half of women aged 40-44 in 2002 were what Amy Blackstone and Mahala Dyer Stewart refer to as “childfree,” or purposefully not intending to have children. Blackstone and Stewart’s forthcoming 2016 article in The Family Journal, “There’s More Thinking to Decide”: How the Childfree Decide Not to Parent, engages the topic and extends the scholarly and public work Blackstone has done, including her shared blog, We’re Not Having a Baby. When researchers explore why people do not have children, they find that the reasons are strikingly similar to reasons why people do have children. For example, “motivation to develop or maintain meaningful relationships” is a reason that some people have children – and a reason that others do not. Scholars are less certain on how people come to the decision to to be childfree. In their new article, Blackstone and Stewart find that, as is often the case with media portrayals of contemporary families, descriptions of how people come to the decision to be childfree have been oversimplified. People who are childfree put a significant amount of thought into the formation of their families, as they report. 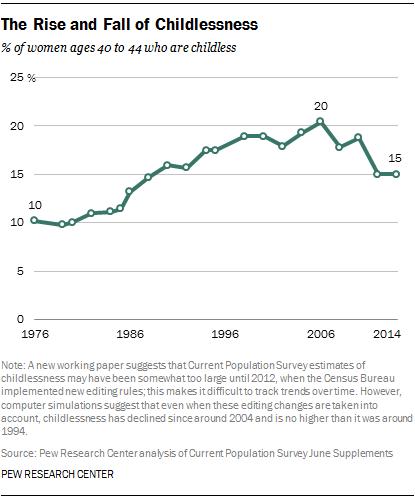 Blackstone and Stewart conducted semi-structured interviews with 21 women and 10 men, with an average age of 34, who are intentionally childfree. After several coding sessions, Blackstone and Stewart identified 18 distinct themes that described some aspect of decision-making with regard to living childfree. Ultimately, the authors concluded that being childfree was a conscious decision that arose through a process. These patterns were reported by both men and women respondents, but in slightly different ways. People who have decided not to have kids arguably have been more thoughtful than those who decided to have kids. It’s deliberate, it’s respectful, ethical, and it’s a real honest, good, fair, and, for many people, right decision. Contrary to misconceptions that the decision to be childfree is a “snap” decision, Blackstone and Stewart note that respondents conceptualized their childfree lifestyle as “a working decision” that developed over time. Many respondents had desired to live childfree since they were young; others began the process of deciding to be childfree when they witnessed their siblings and peers raising children. Despite some concrete milestones in the process of deciding to be childfree, respondents emphasized that it was not one experience alone that sustained the decision. One respondent said, “I did sort of take my temperature every five, six, years to make sure I didn’t want them.” Though both women and men described their childfree lifestyle as a “working decision,” women were more likely to include their partners in that decision-making process by talking about the decision, while men were more likely to make the decision independently. Braxton Jones is a graduate student in sociology at the University of New Hampshire, and serves as a Graduate Research and Public Affairs Scholar for the Council on Contemporary Families, where this post originally appeared. "There were gender differences in the motives for these decisions. Women were more likely to make the decision based on concern for others...In contrast, men more often made the decision to live childfree “after giving careful and deliberate thought to the potential consequences of parenting for their own, everyday lives, habits, and activities and what they would be giving up were they to become parents.”"
Mirthless laughter. Men don't have to give up much since the burden falls disproportionately on the mother. Just goes to show how much more license men have to be selfish, while women are expected to put everyone else before themselves. Having said that, I'm always skeptical of people's stated motivations. Just like Trump voters say their deal is economic anxiety when it turns out they're actually driven by racial resentment (which seems to be the case for Brexit as well), people aren't always willing to admit the truth to themselves. So I could see women stating their concern is for others, because that's an acceptable "excuse" for women (see, she's still nurturing! ), whereas "I don't wanna do all that extra work" wouldn't be.